Black Raven Climbing Rope Dog Leash built with Military spec rope. This makes for a strong & reliable training or hiking lead for large dogs. Anyone looking for a quality made leash for their big dog would find that our custom leashes will quickly become a favorite. Designed for medium to extra large dog. This lead will hold up under some of the most extreme conditions. 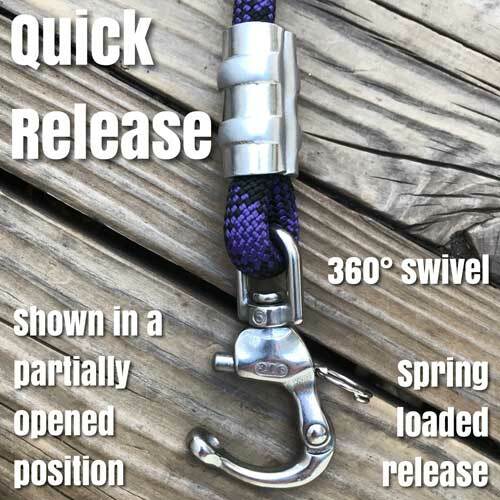 The Black Raven Climbing Rope Dog Leash can be ordered in multiple lengths. The two or three foot control leads work perfect as a traffic lead keeping your dog close. The four or six foot lead work well for regular walking or training. 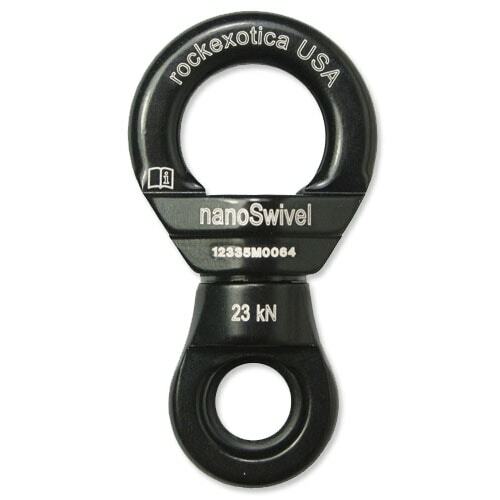 An Optional 3.5 inch compact black locking carabiner is a popular choice and works well with this lead especially if you have a large dog that may pull or otherwise take you for a walk. 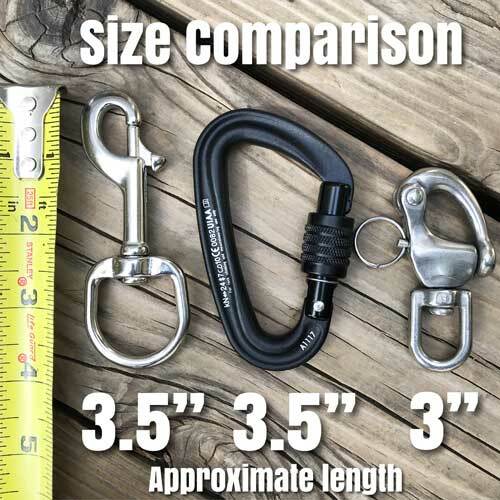 Our 3.5 inch/89mm 316 stainless steel clip is stronger than most similar styled clips seen on most leashes. 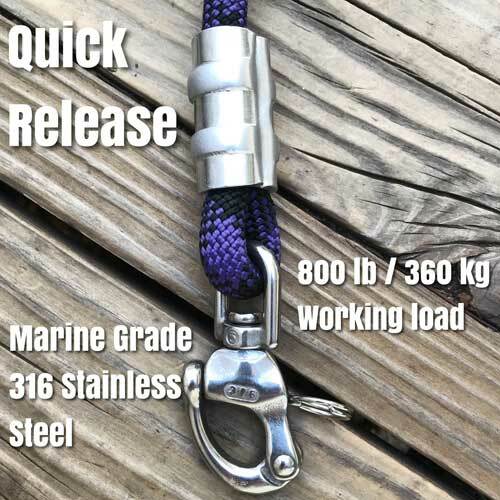 What we use is a better quality and comes standard with the leash unless you upgrade to a different style. The stainless steel clip is a good choice for most dogs. Dog leashes are a simple design but should not be designed with simple materials. We build leashes using some of the best materials made in the USA and believe dogs deserve nothing less. 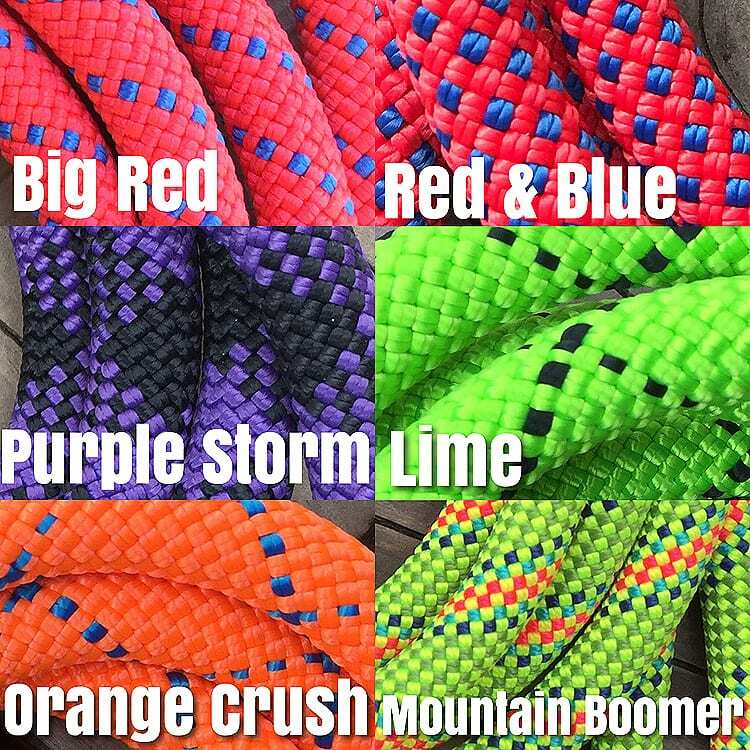 We are confident that you will find our custom climbing rope dog leashes to be among the best made. Your dog’s leash is it’s lifeline between you and harms way. We keep this in mind when building each and every custom dog leash. The best leash you can buy ! After searching many hours on the internet and local petstores here in the UK I was dismayed at the poor quality of the many dog leads and collars on offer ,then I found this website and was impressed with the high quality parts used in the contruction of this product , from buttery smooth nano swival to climbing strength carabiner and leash rope , if you want the best out there go for the ultimate dog leash ( mine was in Raven Black and it looks and awesome and performs flawlessly!!) Also its nice to own something that is hand made and not mass produced by machines!! Hi Ian, Thanks so much for the review, its greatly appreciated. 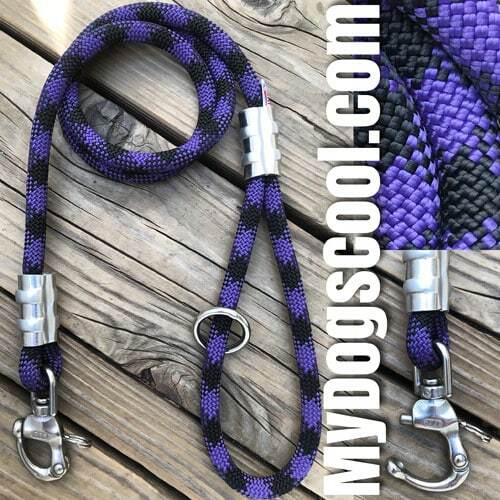 We enjoy building custom climbing rope dog leashes, especially when we know that pet stores fail to offer the quality we try so hard to provided to customers like yourself wanting a better than average dog leash. Brilliant lead, strong and a pleasure to use even in wet conditions. Excellent service too, dilivered to the UK in less than a week and at Christmas time too. I bought this leash after losing a dog to a broken leash. I absolutely love the strength and build quality of this leash and I will never buy a cheap store bought leash again. I highly recommend Mydogscool leashes. Thank you! We really appreciate the positive feed back and like that you would recommend our custom dog leashes. We're sorry to hear about you losing you're dog to someone else's faulty leash. We test all of our leashes and use quality materials to ensure that our leashes are among the best and most reliable. We trust our own dogs on the leashes we build and would not sell something we did not believe to be both safe and reliable. Thanks again for the 5 star review! Just the other day we had a robbery and 4 individuals ran from a car on the traffic stop, next to the interstate. I was called to another county to help assist. Needless to say, the terrain involved LOTS of sticker bushes, trees, and about 100 other things that would have shredded and damaged other leads. Despite me being all cut up and bloody, the lead held up great. Ultimately the 4 bad guys were located after being chased by the dog, and arrested.